The firm of Schuyler, Hartley and Graham may be the best known of the Civil War military outfitters by virtue of their outstanding 1864 illustrated catalog. 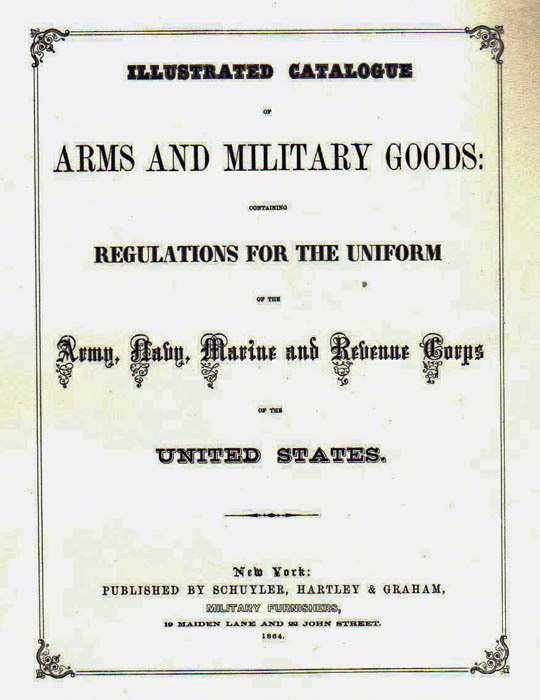 However, they were not the only firm selling military goods during the Civil War. There were a number of other important firms, such as the Horstmann's in Philadelphia. These firms both sold to the government via contracts and to the public at large. It was customary for officers to dress and equip themselves and they turned to firms like Schuyler, Hartley and Graham for all their needs. The catalog offers weapons, accoutrements, and insignia. It did not offer uniforms as off the rack clothing was uncommon and military tailors, such as Brooks Brothers, were still handling gentlemen’s clothing needs, including military uniforms. 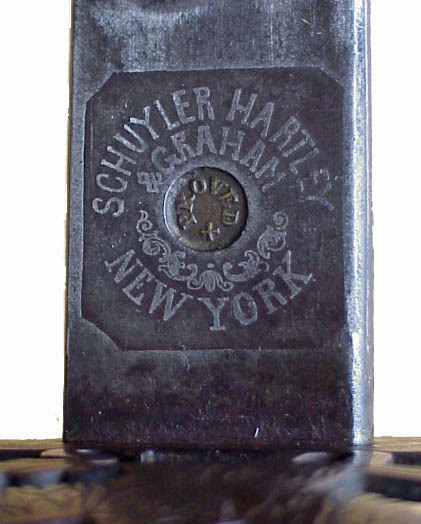 It is likely that most all of the items sold by Schuyler, Hartley and Graham were actually manufactured by other firms. The firm was founded in 1854 by Jacob Rutsen Schuyler (1816 - 1887) with a store at 13 Maiden Lane in New York City. Jacob Schuyler had prior experience in business as did the men who would become his partners. Marcellus Hartley (1827-1902) began as an entry clerk and assistant bookkeeper in the importing house of Francis Tomes and Sons, of Maiden Lane, dealers in fancy, hardware and sporting goods in 1847. He had a good head for business. He met Jacob Rutsen Schuyler and Malcolm Graham, (1832-1899) who were at the time with the firm of Smith, Young and Company and they discussed forming a partnership and establishing their own firm. During the years prior to the Civil War the principles visited Europe several times and established working relationships with various European firms selling weapons, shorting goods and military goods. The firm was successful and survived the panic of 1857. In 1858 it moved to 19 Maiden Lane, its location during the Civil War. By the time of the American Civil War they were in a good position to take advantage of an expanding market for military goods. The firm’s extensive European contacts and knowledge of the trade caused the government to use Hartley as an agent for firearm purchases in Europe. Hartley traveled with his family and kept a steady correspondence with Secretary of War, Edwin Stanton and his assistant Peter H. Watson. Also active purchasing arms in Europe was George L. Schuyler, who was a relative of Jacob Rutsen Schuyler, but does not appear to have had any business association. Hartley not only purchased for the government. He gathered intelligence on Confederate purchases and attempted to forestall Confederate deliveries and to preempt their attempted purchases. All in all Hartley arranged the purchase of about 200,000 Enfield rifles and many other arms from various sources in England, Belgium and Austria. After the war the firm remained in the business and even exported arms to France during the Franco-Prussian War. In 1878 Schuyler retired and in 1899 Graham died. The firm continued past Marcellus Hartley’s death in 1902 but passed from existence about 1915. The focus of its activity after the Civil War was firearms and metallic cartridges sales through its association with the Remington Arms Company and the Union Metallic Cartridge Company.